My grandson enjoyed painting a soda liter bottle. I forgot to tell him the bottle would hang upside down. But we decided that was the way the birds would want it. Now they can enjoy Brody's painting while they sit in the tree or fly above it. I used an Exacto knife to cut two small holes opposite each other in the "top" and pushed a wire through for hanging. Then I cut two holes about one-fourth above the bottom of the bottle and Brody poked a stick through. One-half inch above those holes are small holes that a bird can put his beak into to get the birdseed. You could also use an electric drill to cut the holes - but being a former kindergarten teacher, I find Exacto knives have a lot of uses and aren't as dangerous as some of my husband's tools. 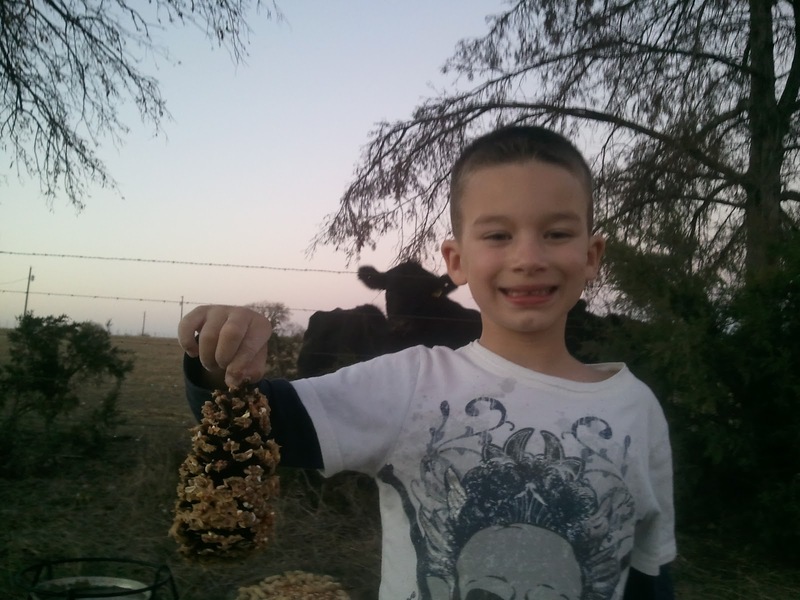 Children love smearing peanut butter on a pine cone then rolling it in bird seed. When I taught school, it was a favorite activity for students, probably because they enjoyed the rolling, sensory motion of putting the seeds on. More than a few fingers put that peanut butter in their mouths. Vegetable shortening could be used instead of peanut products if allergies are an issue. Tie a piece of yarn, string or wire around the tip of the cone and hang it from a tree near a branch. I buy 50 pound bags of chicken or hen scratch at the feed store (about $12.00) and the birds, chickens and guineas all enjoy it. Add unshelled sunflower seeds and peanuts to attract cardinals and blueyjays. The birds also enjoy safflower seeds but they are more expensive. We made a bird Suet mixture. Suet is raw beef or mutton fat. Due to its high energy content, suet is used by cold weather explorers to supplement the high daily energy requirement needed to travel in such climates. For bird food, it is all right to substitute lard or peanut butter. This recipe was found on Fun Food and Facts. I halved the recipe and it made the tray of fat "cookies" above. You can find more household bird food recipes and a chart of the birds that are attracted to certain foods on Home for Wild Birds as well as how to upcycle a milk jug to make a bird feeder. Soften the lard to room temperature. Stir in the other ingredients a couple of cups at a time until the mixture is quite thick. Children will love mixing this with their hands. 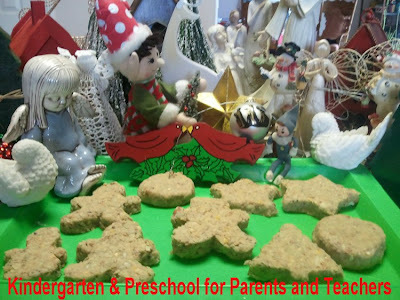 Roll it out with a rolling pin and let children cut out "cookies." Freeze. The mixture can also be frozen in tuna cans or plastic tubs about 4 inches by 4 inches which would fit nicely in wire suet cage feeders. You could push thin chicken or fishing wire through the thick cookie before freezing. Children would be proud to give these suet cookies as gifts. I caught the mischievous Elf sitting on the cookie tray nibbling some of our Suet mixture, so it must be good. Reading: Buy or borrow bird books or field guilds from the library so children can search and identify the various species they observe and learn their names, habitats, diets, flying feats and interesting facts. Writing: Encourage children to keep a Bird Watching Journal. Perhaps they will be inspired to write a story about a bird. Math: Teach them to record and count how many times they see a particular species of bird during a specified time, perhaps making a calendar chart. Science: Buy a pair of binoculars to make it more fun for spotting and observing birds. Recording and learning facts about critters are important steps in science exploration. Health: Being outdoors in nature will help children relax and appreciate our fascinating world. Patience: We have been trying to attract cardinals into our yard since we moved here. After four years, we finally have cardinals! You will have better luck with birds visiting if you have water available. Shallow birdbaths work best because they are easier to keep clean and put fresh water in daily. They are also more likely to attract butterflies. I love to sit on my back porch and listen to the symphony of bird songs. It takes me back to when I was a child and would hear them in my Kansas neighborhood where we had many trees. I close my eyes, take deep breaths and focus on the amazing array of bird songs. It brings me a feeling of home, hope, comfort and gratefulness for God's critters. For a glimpse into Kindergarten see my book. 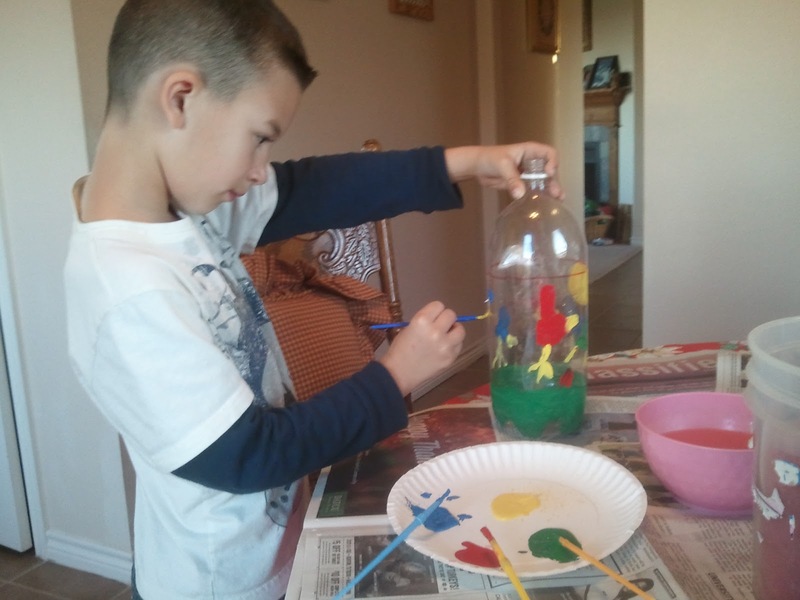 Would you like inexpensive ideas, activities, and games to teach your child through play? We can help save your sanity, one project at a time, with The Happy Mommy Handbook: The Ultimate How-to Guide on Keeping Your Toddlers and Preschoolers Busy, Out of Trouble and Motivated to Learn. Both are bestsellers and helpful gifts for parents and teachers. Ebooks are only $3.99. Also available on Barnes & Noble and Kobo. I love this bird feeder. What an artist you have! We haven't worked with suet yet. It looks easy to use. I had never even heard of Suet until I started looking for bird feeder recipes. Since I don't really like to eat much meat - or touch or cook it - I prefer the vegetable shortening mixture which would be cheaper than using peanut butter. 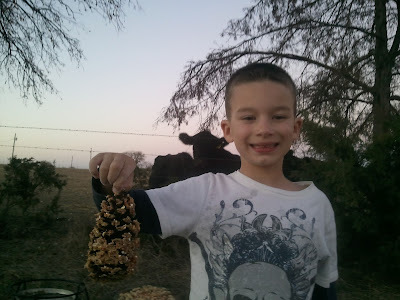 i tasted the Suet we made and it was delicious! Cornmeal, oatmeal, nuts, wheat flour are all good for people and you can add dried fruit like cherries, raisons, prunes, apples, etc. People who run long distances sled rides take with them the Suet made with meat because they burn so many calories. It's great! 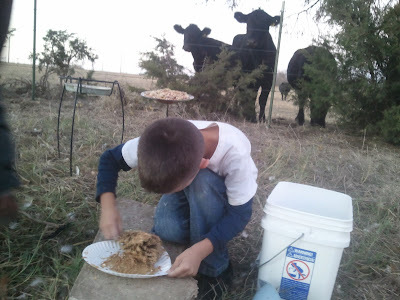 I love the picture of the cows in the background. It reminds me of my childhood. We have a lot of cardinals where I live now and I love watching them. I guess I shouldn't take for granted how easy it is to see them here. My bird expert friend told me that they are probably around early in the morning and late in evening. I just went outside and have soooo many birds since we put out Brody's feeders! Amazing. It sounds a little crazy but I have a chair by our chicken run and sit and watch the cute fat chickens waddling around - relaxing- and now I have more birds to watch. Once we even had peacocks visiting from 3 miles away - neighbor saw them and wanted them back - which was okay with us bc they were eating all my plants! Such a wonderful post! What a lucky grandson! I think my son would love this! Thanks for stopping by my blog! I was very honored! Lisa - you are the one with the wonderful post and support. I hope you have an amazing Christmas season. Hi Susan! I love the pine cone idea. I can't wait to try this with my preschool kids. Thanks so much for sharing! Thank you Tulip. You have such wonderful parties. I hope you have a great day! I love the birds a suet feeder attracts, but sadly it melts here in Southern Arizona and dripped suet is not that great. Sitting and watching bird feeders is one of my favorite things to do. Giggles: I LOVE your blog - very interesting. Sounds like you are enjoying you career, education and life. Wonderful! And helping others. It's a win-win, for sure. 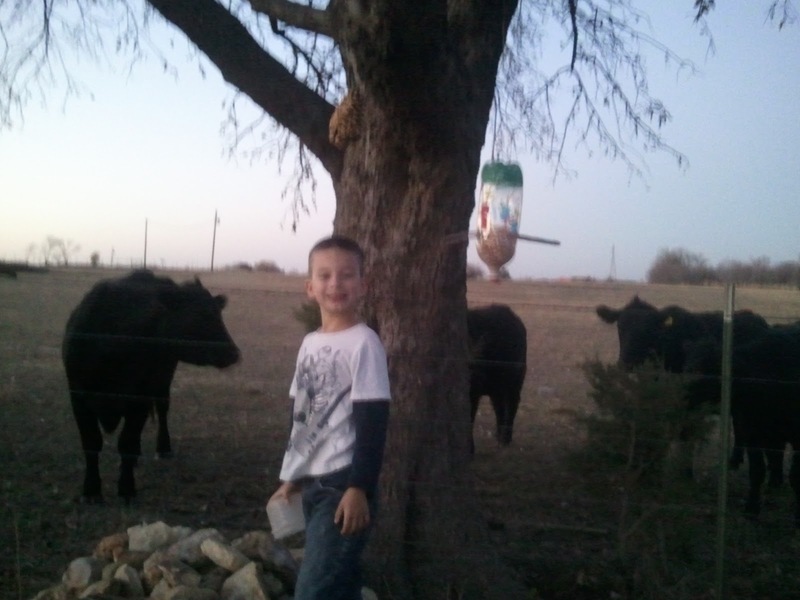 We get a lot of birds visiting at our house and I've always wanted a bird feeder. I'm going to try this. Our only issue is keeping the squirrels away from it. We have lots of those too! I just collected some pine cones thinking to try to make Xmas ornaments but I think I'll make a few bird feeders too. Now, to get some bird seed! I teach preschool and this month we are learning about birds. So many years we have done the pine cone/peanut butter/bird seed project; I'm looking for something different. Thank goodness I found your site! I'm going to try the Bird Suet Recipe, looks like fun for my class!